It doesn't take long for a new Android phone or tablet to get cluttered up with rolls of pictures, redundant apps, unused widgets, cached files and the troublingly vague "Misc" data that seems to take up more and more internal storage with each passing week. Take a few minutes to blow the cobwebs out of your device's cupboards and get your streamlined, lean gadget back. Your phone or tablet hangs on to all kinds of cached data for easy access. Some of it's very useful, some of it less so. 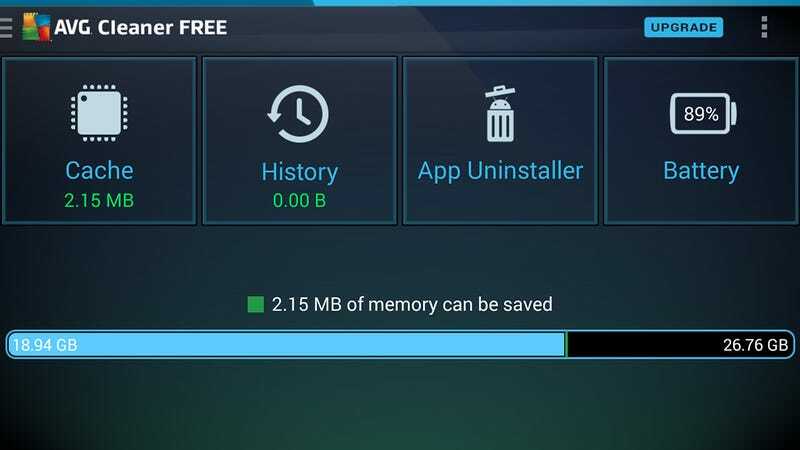 Employ the services of a smart housekeeping tool such as CCleaner (free) or AVG Cleaner (free) to work out which of these digital boxes of bytes you can safely toss out into the garbage. We've picked those two apps because of their established reputations as desktop utilities, but there are plenty of alternatives around. Both programs will run a thorough scan of your device's file system, searching for data that's trying hard to look busy but which actually serves no real purpose. There's the option to delete browser history files and the contents of the clipboard, for example, as well as data inadvertently left behind by sudden crashes and unexpected reboots. The AVG tool lets you run regular scans if you want to have potential problems cleared up automatically. Do you really need every image you've ever taken on your mobile? Are they all backed up to Google+ or Dropbox? Or both? Some time spent sifting through the gallery app on your device can clear up a significant amount of storage space, particularly when high-definition video clips are taken into consideration. You don't have to obliterate all of your most precious memories, but you might want to consider moving them somewhere else. SMS text messages, call logs and downloaded files can all be targeted too. The amount of space you save as a result may not be huge, but the associated apps will run that little bit more briskly if they have less data to chew through each time they boot up. It's also worth having a run through apps such as Dropbox and Google Drive to see which files you've cached for offline use—if you've watched your brother's latest skiing clip, maybe it's time to unsync it. The apps we've previously mentioned can help out in some of these areas if you don't want to sort through everything manually. Apps that you no longer use can take up large chunks of the storage on your phone or tablet, particularly the more advanced tools and more complex games. Press and hold on any app icon and drag it to the App info slot to see how much room it's taking up. If you don't like what you see then you can drag it to the Uninstall slot instead to kick it off your device. You can be pretty ruthless here, as reinstalling apps only takes a few seconds if you realize you've made a mistake. There are lots of possibilities here (uninstalling Facebook and using the mobile site instead, perhaps), and look inside individual apps too: you could merge some of your Google contacts, delete some saved offline maps, and reduce the number of emails synced by the Gmail app. Again, the smart cleaning apps we've already referred to can do the job for you if you want—they can work out which apps take up the most room, which apps you use the least, how much data they use, and more. If your phone manufacturer pre-installed a few apps that you are never going to get around to using, now is a good opportunity to get rid of them. Flicking through four or five home screens might give you something to do while you wait on the subway platform, but take a moment to weigh up whether you actually need all of those apps and widgets to be so accessible. After all, it's only one tap from the home screen to get into the drawer where all of your apps reside, so it's probably easier to get to them there than from the fifth home screen to the right. You can approach widgets in the same way. Focus on the ones that you actually use rather than the ones that look the prettiest. The benefits here are the speed with which you can get to the stuff that you really need rather than any significant increases in performance or storage space. Try spending a week without Instagram and Twitter on your home screen and see how much time you save by not scrolling idly through your social media feeds every time you unlocked your mobile. For a truly minimal approach, you could consider installing an alternative launcher. If you want to take a truly drastic approach to the problem, how about a factory reset? Wave goodbye to all that digital detritus, all those unused apps and all those unnecessary screenshots, and start again with a fresh clean slate. With your Google account holding most of your data in the cloud—contacts, emails, purchased apps, calendars, even Wi-Fi passwords—a factory reset is not quite as problematic as you might think. Be under no illusions, though: a factory reset will wipe everything on your phone or tablet and bump you back to the initial setup process. Are your photos and videos safely backed up somewhere else? Do you have time to log in to all of your apps and services again? Can your favorite games retrieve your saved games from the cloud? If the answers are all "yes" or "who cares? ", the factory reset option is under Backup & reset in Settings. Any other space-saving tips we missed that have worked for you? Share them below!